1. As August draws to a close, share what’s been your favorite weekend of the entire summer? My favorite summer weekend would have to be one of the weekends (and there were several) that I spent time on St. Simon’s Island, with my honey 🙂 –and it would definitely have to be one of the beach weekends that didn’t involve any car trouble or rain! 2. Labor Day is marked in the US of A on Monday, September 1st. What paying job have you held that you’ve loved the most? Liked the least? The job I loved most was, without a doubt, working as a first grade paraprofessional. The pay was lousy, as well as a few of the tasks required, but I really loved and enjoyed my job! After 14 1/2 wonderful years of employment with the same teacher, I threw in the towel after I was paired with a young teacher who had very little classroom control, and even less work ethic. Sigh. I really tried, but I only lasted the first nine weeks of the new school year. I only regret that my career ended on such a sour note. As for the job I liked the least, that would definitely be working in the restaurant section of my uncle’s souvenir shop. I only lasted a couple of days! 3. Does the new school year start before or after Labor Day where you live? When do you think it should begin? There is much discussion now about older students having later start times to their school day…your thoughts? Our students will have attended school for an entire month by the time Labor Day gets here! For some reason, our system is always one of the first to start back to school each year! Only the local preschool waits until after Labor Day to begin, which is the way I think it should be for all schools! As for later start times for older students, I think it might be a good idea for teens. Years ago, our teen-aged sons never liked getting up early, and they were habitually tardy for school, much to my dismay! A later start time may have been beneficial for them, but I guess we’ll never know! 4. What’s something you’ve worked at recently that could be deemed a ‘labor of love’? The first thing that comes to mind is tending to my flock of hens! With ‘my girls’, it seems like it’s always something. Just last night, Ed and I were in the coop, after dark, with our flashlights… It was time for a follow up worm treatment, as well as an inspection of their feet. The girls didn’t appreciate either activity! I can actually relate to all three, but at this point in my life, I’ll say ‘all work and no play makes Jack a dull boy.’ For years, I was a working wife and mother, always busy, doing something for others. These days, I’m retired and can finally do whatever I want, whenever I want to 🙂 I can only stand so much vacuuming, mopping and dusting, without taking some time to do something enjoyable! Hooray for play time! Believe it or not, I’ve never tried lobster! I only like crab if it’s deviled, and, even then, I’ll only eat a small amount of it. Shrimp is basically the only seafood that I really care for. 7. Albert Einstein is quoted as saying, ‘Three rules of work: Out of clutter find simplicity; From discord find harmony; In the middle of difficulty lies opportunity.’ Which of the three do you consider to be the most important? Share one of your own ‘rules of work’. Well, it’s hard for me to find simplicity (or anything else) from clutter, and I don’t handle discord very well, so I guess that leaves ‘in the middle of difficulty lies opportunity’. Using a computer came to mind when I read this quote! Every time I encounter a computer problem, I tell myself to consider it an opportunity to learn something new! (I’m still trying to convince myself!) Thank goodness for two sons who can usually help me with any computer-related difficulty that may arise! As for my own rule of work: Be on time, and always do your best! Random: Life never ceases to amaze me. Twelve years ago I was working as a first grade paraprofessional, and loving it. We had several adorable students in our class, but one little girl was exceptionally smart and very sweet. This student was one of my all-time favorites, and would often drop by the room to see me, even after she’d moved on to higher grades. Years later, she even invited me to become her friend on Facebook! Flash forward eleven years, and this student was now a high school junior, who had continued to excel in school. You know, sometimes things happen, and in the middle of her junior year, she found herself pregnant. When I first heard this news, my heart sank. I feared that her life was going to be ruined. I needn’t have worried, she’s done fine. She had a beautiful baby boy, last August, at the beginning of her senior year. She recovered, took care of her baby and attended school, and still managed to graduate third in her class! I am so proud of all that she’s been able to accomplish, so far. Thankfully, she’s blessed with a loving, and very supportive Christian family. They’ve been beside her every step of the way, unlike the boyfriend who eventually went away. Recently, this student won a scholarship to a university, located two hours away from our town. She had to make the difficult decision to leave her adorable baby in the care of her family, in order to use the scholarship. Her family is rising to the challenge of caring for her son while she attends college, in order to help her have the best chance at success. I wish them all well, I’m sure the challenge isn’t easy for anyone, but here’s the final ‘kicker’ to my story. It’s turning out to be ‘one of those’ weeks. It’s only Wednesday, and, so far, nothing in my week has gone as planned. I think it’s a good time to sit back, relax, and take a little ‘Hodgepodge Time’. As always, thanks to Joyce for making this small pleasure possible. Perhaps some marital or parenting advice or concerns regarding early childhood education. I’m no expert, but I’ve had lots of experience. I generally need help with all things mechanical or technical! My family didn’t really take summer vacations when I was a child. Once, when I was about twelve or thirteen, my parents and I went to the beach for a couple of days with an aunt, uncle, and a cousin. That’s the closest thing I remember to a family summer vacation. For several summers, during my ‘tween’ years, I’d go (without my parents) and spend a week with my older brother and his wife. They lived in Jacksonville, Florida, about 2 1/2 hours from my parents’ home. I always had fun during those visits, and when I think of my childhood summer vacations, I remember of those simple, fun times. While my own children were growing up, I was always in charge of planning our summer vacations. We took two vacations every summer, and we spent most of that time camping. Occasionally, we would spend a night or two in a motel on the beach, or in a cabin in the mountains. It’s always interesting to ask our, now grown, children what they remember most about our family vacations. One answer is “getting to buy some ‘Brach’s pick-a-mix’ candy” at the grocery store, while another is “getting to watch cable tv”. It’s funny what sticks out in their minds. If you’re talking swimming, on a hot summer day, then I’d choose a pool. Otherwise, just take me to the ocean, and I’ll enjoy the cool ocean breeze in the shade of a tree or an umbrella. If you’re asking if I’m guilty of exercising ‘tough love’, the answer is yes, during an extremely difficult period of raising a ‘strong-willed’, disrespectful son. It was, without a doubt, one of the hardest things I’ve ever done in my life, but it was necessary. Thanks to God, our story has a happy ending. While I’m not overly fond of some of the foods listed, the only food on the list that I actually hate is beets. I’d like to add sauerkraut to the list. The first favorite that comes to my mind is Nicholas Sparks’ book, The Last Song, which was made into a movie, too, and filmed at nearby Tybee Island. The movie was good, but the book was much better! We’re continuing to be plagued by daily showers of rain! I think it’s only missed two days raining, out of the past three weeks! What a stark contrast to the summer when we siphoned the bath water out of the house through a garden hose, in an effort to keep our dying grass alive! Summers come and go every year. Some years summers are quite memorable, while some years they are not. Sometimes summers are memorable for good reasons, while others are memorable for bad reasons. 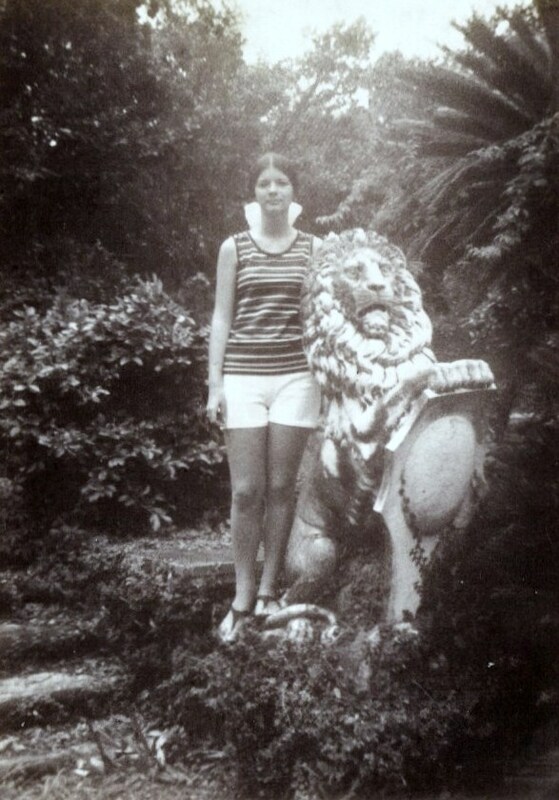 The summer of 1972 was memorable because it was the summer Ed and I got married. 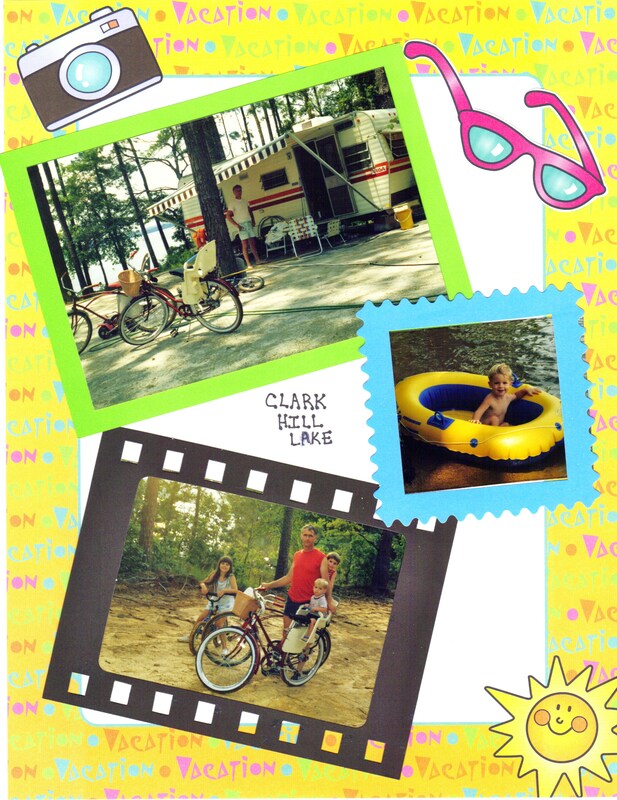 The summer of 1986 was memorable because our family discovered camping that year, and had loads of fun. I remember the painful summer of 1994 when my doctor and I spent the entire summer trying to find the right combination of drugs to put my rheumatoid arthritis into remission, and I remember my mother dying during the summer of 1997. The summer of 2007 found Ed and I busily finishing up the construction of our new home, while 2010 was the awful summer that our (now) daughter-in-law, Jennifer, discovered that she had cancer–then lost her mother, just a few short weeks later. Yes, some summers are more memorable than others! Toward the end of June, things began to take a bit of a downhill plunge. My daughter and I had a disagreement toward the end of June, and we haven’t been able to resolve the situation. It’s complicated. Unfortunately, our disagreement overshadowed the rest of the summer of 2012. In addition, I’ve spent most of the summer being plagued by health issues that I can’t get totally resolved. This, too, is complicated. Both issues are so frustrating! Why does life have to be so complicated at times? I don’t know what the fall of 2012 will bring, but I’m hoping and praying that things will get back on track one of these days. I’ll be happy to put the summer of 2012 behind me and just move forward, even though I realize my summers are growing more scarce with each passing one. How about you? Will your summer of 2012 be a memorable one? If so, why? I’ve always loved going to the beach, for as long as I can remember! Whenever I was growing up, we didn’t make it to the beach often, so the times I went are very memorable to me. One of my most memorable beach trips was just a few days before I graduated from high school. Me and two of my girl friends, who were also graduating, went to the beach and spent the night–without our parents. Only one of us was 18, so I guess she rented the motel room. We thought we were something! The photo (of me) below was taken on that trip. A couple of years after Ed and I were married, and I went to work, our first major purchase was a new boat! We lived near the coast, so we spent many happy hours riding, fishing, and skiing on the weekends. I know why boats are called “vessels of freedom”. There’s not a better feeling in the world than gliding across the water, feeling the breeze in your face. We sold our boat when we moved back to our hometown because we were too far from the water to get much use out of it. 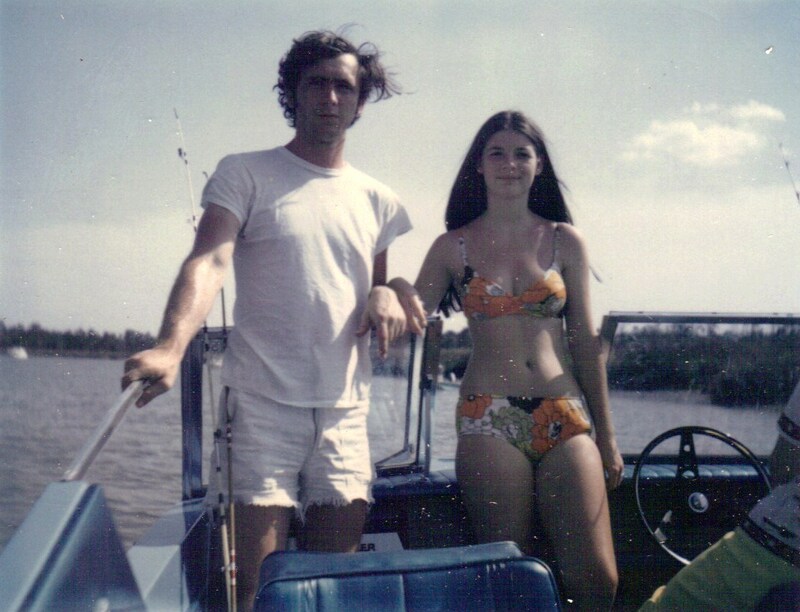 We’ve only been boating once since those days, back in the 70’s. Although I never really relaxed while on the back of the motorcycle, I did enjoy the element of adventure that riding one provided–and you can’t get much closer to your honey than on a motorcycle! Ed and I owned a couple of motorcycles during our early years of marriage, and we took a few short motorcycle trips with friends. The most memorable trip found us in a laundromat wearing black trash bags while our clothes were being dried–after being drenched in a storm! We spent eight summers camping with our kids–and I loved every minute of it! Lots of family time around campfires, bike rides, and swimming. 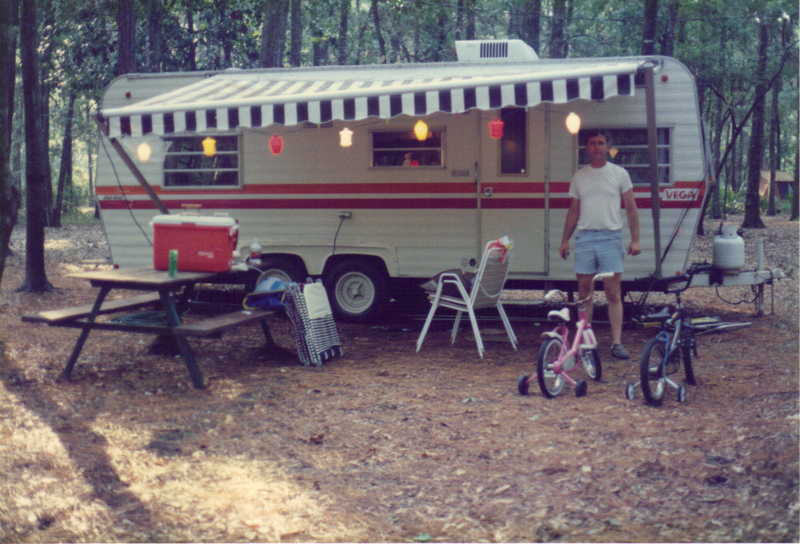 Oh, and how I loved hanging those pretty party lights on the camper awning…that always put me in a “festive” mood! I figured if I was going to take a job, it might as well be a job with lots of holidays, and the same hours as my kids, so I applied to be a paraprofessional! If you’re going to be a working mom, that’s a nice way to do it. I loved having summers off and spending time with our kids. I sure had some good times out in the garden, and later in the kitchen, with both sets of our parents! It was work, but we had a good time doing it. Ed and I still laugh about one particular time we were picking peas with his parents. Ed hit the pea vines with a stick and yelled “Snake”! Ed’s mama and I almost wet our pants trying to get away from there! Of course, there was no snake, Ed was just being funny. He’s always been a prankster. The photo below was taken in the 70’s. 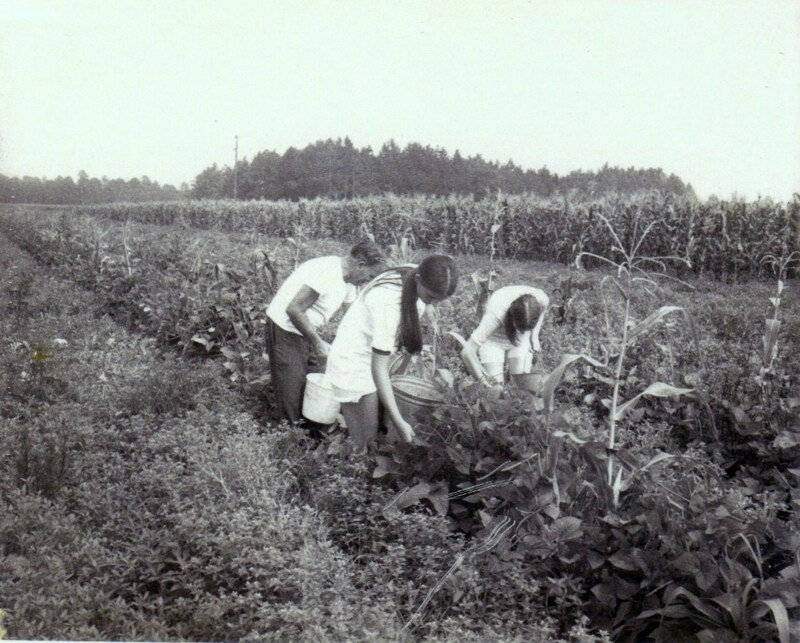 That’s Ed’s daddy, me, and a friend picking peas. That was one long row of peas! We sold our camper and put in a pool in the mid-nineties! Our children were entering their “tween years” by then. Camping was no longer cool, but having a pool was! We had our pool set up so we could walk out of the living room door, cross a short walkway, then step up on the pool deck. Ed built the deck by himself. 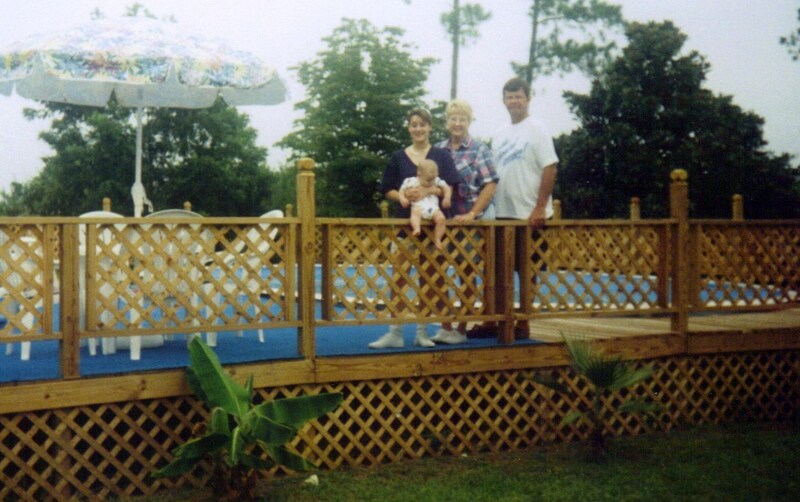 We enjoyed that pool and deck for ten years before we took it all down! For as long as I can remember, our family has always taken a vacation during the week of mine and Ed’s wedding anniversary–it was our anniversary get-away. However, Ed and I had probably been married for close to twenty years before we ever went on an anniversary get-away without our children. Finally, one year, at Ed’s suggestion, we left the children behind. We went 30 miles from home, went to dinner, a movie, then we got a motel room with a giant Jacuzzi! It was one of our most memorable anniversaries. 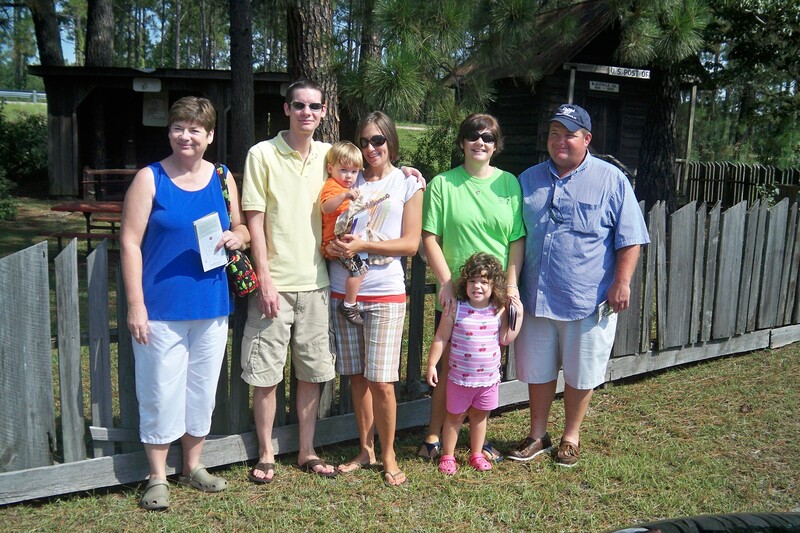 A few times, we’ve been fortunate enough to share vacation trips with our three grown children and their families. Although we’ve only been able to have the entire crew together once, we had fun with those who were able to come along. We’re living proof that you don’t have to leave home to have a great time! Gather the family around, build a fire or light the grill, crank up the music, and you have the makings of a good time! 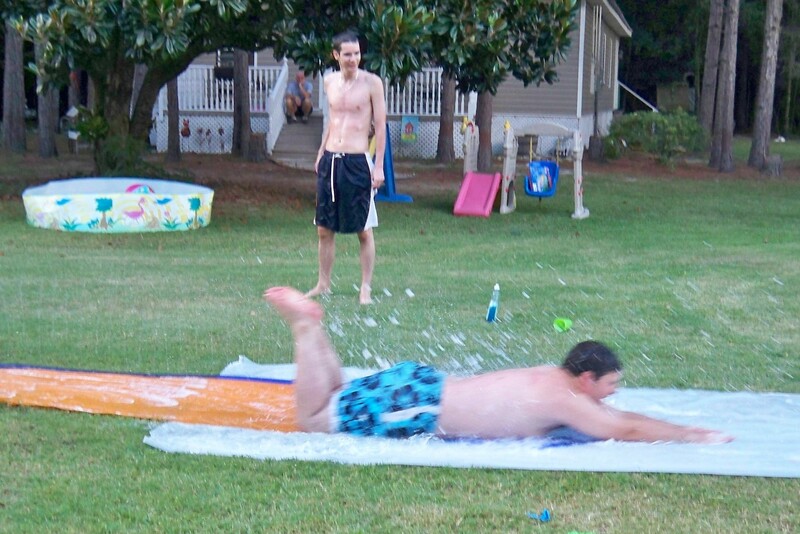 We may do anything from playing yard games to getting on a slip-n-slide. Boys will be boys…no matter what their age! I’m sure I could think of a few more favorite memories, but these are at the top of my list. How about you, what are some of your favorite summer memories? School’s Out For The Summer?! Oh, my! It’s barely past the middle of May, and school is already out for the summer here. When I went to school, we attended school until after the first of June! Years later, when I was employed at school, we still went to school until after Memorial Day. The twist was, we didn’t go back to school until mid to late August. These days, school is already back in session by the end of July or the first of August! What ever happened to the days of summer? When I was a kid, the fourth of July pretty much signaled that summer was officially in “full swing”. These days, by the fourth of July, “back to school” sales are already being advertised on television. Something about this just doesn’t seem right! When I was a kid, I sort of hated to see the school years end. I never seemed to get comfortable with everything until after Christmas. It took me that long to feel at ease with my teachers and classmates. Then the inevitable always happened–school would end, and I’d have to start all over in the fall! While I worked as a paraprofessional at school, I felt the same way. By the latter part of the school year, I knew each student’s strength’s and weaknesses, and we all felt like family. I knew their behavior patterns, and how to best handle them. I’d watched them learn and grow. Of course, by then it was almost time for school to get out for summer–which meant starting all over again! I always loved “post planning” days at school(the days after the children are finished, but the employees aren’t). We could wear shorts to work, and we did lots of cleaning out and throwing away in our classrooms! Who doesn’t love a good “spring cleaning”? Out with the old, getting ready for the new! We also had a couple of end-of-the-year staff luncheons, which always meant GOOD FOOD! What a wonderful treat–no cafeteria food, and longer than twenty minutes to eat! Pure Heaven! After three days of post-planning, I was able to go home to be with my children for the summer. Our family filled our summers with lots of camping trips while our children were growing up. We had a camper, and we always took two full weeks of vacation each summer. We would camp for a week in June, then another week in July. We didn’t usually travel very far, because none of us liked to ride. Our trips were usually within two or three hours of home, and included state parks, the beach, and a few area tourist attractions. We spent many happy hours swimming, fishing, riding bicycles, telling ghost stories and roasting marshmallows around campfires, playing on playgrounds, and of course, shopping! We always did lots of shopping, usually at Wal-mart. We had to visit every Wal-mart along the route! I miss those sweet days. They passed entirely too fast. These days, those precious children, in the photos above, range in ages from thirty-two to twenty-four! Two of them now have children of their own. The youngest, the little one in the little raft, will be getting married in five more weeks. These days I’m watching my family fill the summer days with activities for their own children. Madison’s pre-school just ended last week, and she’s already been to a t-ball game, story time at the local library, and had a playdate with some little girls at my daughter-in-law’s house. It’s already another fun summer–and it’s only mid-May! 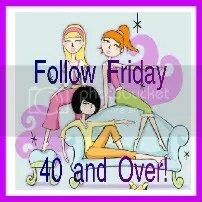 I’m joining Java’s Friday Follow Over 40. If you would like to participate, click her button below.